Rachel and I enjoyed our first date thirteen years ago at a special restaurant on the Delmar Loop in St. Louis named Riddles. Today, the place is named Three Kings. It’s still good. We visit the Loop almost every weekend for a quirky movie at the Tivoli, a visit to Plow Sharing Crafts, and lunch at one of the locally owned restaurants. We don’t have tattoos, but if we did, I’m sure they would come from the Iron Age tattoo studio. The Delmar Loop has been recognized as one of the top ten streets in America. 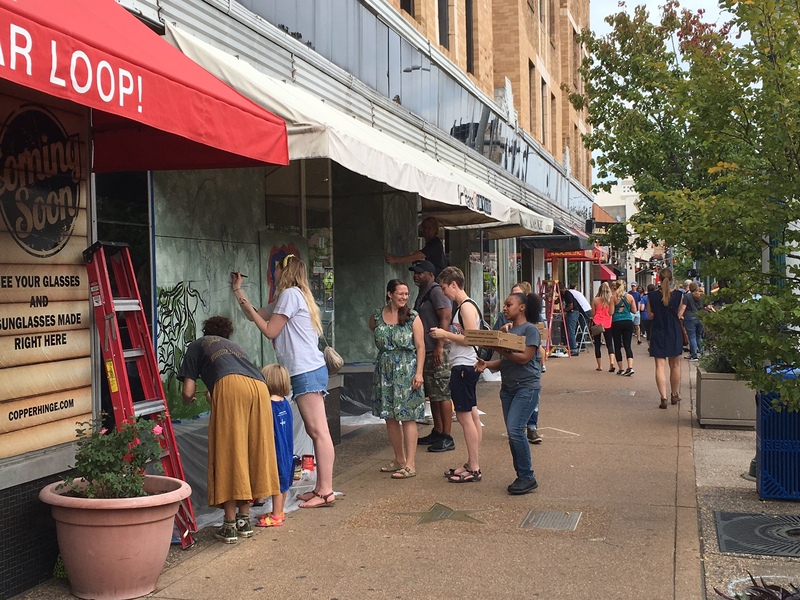 We were saddened to hear the news this past Sunday that a small group of late-night protestors/vandals had chosen to break the windows of several store fronts along the Loop. I guess they figured that vandalizing a tattoo studio, bookstore, free-trade gift store, and frozen yogurt shop would make a poignant political statement. The mostly peaceful protests around the city had been in response to a white police officer being acquitted of a murder charge in the shooting of an African American man. As we talked about it Sunday morning, Rachel and I decided that it was an important time to support the businesses that we had been frequenting for more than a decade. All are locally-owned and employ a very diverse group of people. We weren’t sure what would be open, but our plan was to walk up and down the Loop and offer our patronage. The trip turned out to be a wonderful surprise. The first sight that we encountered was a reporter and camera crew set up near the statue of Chuck Berry. This is across the street from the Blueberry Hill restaurant. The reporter was interviewing a handsome young man dressed in a white dress shirt. There were lots of people on the sidewalk, but no one seemed to be paying attention to the interview. The young man was Missouri’s Governor, Eric Greitens. He had been on the news during the week trying to balance support for peaceful demonstrators and for law enforcement personnel, trying to maintain safety on the streets. Rachel and I had seen photos on the internet of broken windows in front of many businesses that we knew. News reports said that there were more than twenty businesses that were damaged. As I looked around, I did not see any broken windows. The stores and restaurants all looked open and most looked busy. The entire scene felt energetic. When I commented that I was surprised how quickly everything had been fixed, Rachel pointed out the plywood covering parts of most storefronts. The plywood was painted white and blended in with each building’s façade. Filling the sidewalk in front of almost every piece of white plywood were people with paint brushes and containers of colorful paint, creating beauty where there had been destruction just a few hours earlier. Like the Delmar Loop itself, the artists were a diverse group of characters. There were kids, teens, young adults, and older folks. We saw African American, Caucasian, and Asian artists. There was an even split between men and women. The paintings were big and colorful. They captured the emotions of the day, reflecting themes of peace, harmony, and diversity. We stopped to talk with a few of the artists. Two women shared with us that they were a mom and daughter from the neighborhood. They had seen a post asking artists to come down and help transform the Loop. I’d like to say thanks to the thousands of individuals who made their voices heard this week in peaceful ways. Thanks to the Loop business owners and workers who showed resiliency during an unusual time. And especially, thanks to the men, women, and kids who picked up a broom or brush and transformed a special neighborhood. This is what community looks like! This past weekend Rachel and I visited our son, Dan and his wife, Susie in Nashville. When we entered the living room of their beautiful home, I nudged Rachel and nodded toward the far end of the fluffy area rug. Stretched out and sound asleep, was an old friend, Linus. We were happy and a bit surprised to see him. We knew that his time was growing short. As we approached, he awoke, stood, stretched, and looked toward us. Because of his blindness, he more sensed us than looked at us. 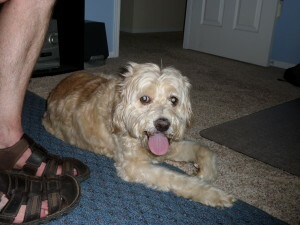 As I patted his side and greeted my “buddy”, Linus leaned against me and wagged his tail in his happy way. Susie and Dan smiled and said that he hadn’t been wagging his tail often these days. I would describe Linus as a medium-sized dog. Susie said he was a cockapoo. That must mean part cocker spaniel and part poodle. He had a shaggy, light colored coat, and hair hung over his eyes. When Linus looked up at you, you could see large white cataracts, covering both eyes. He was fourteen years old. Linus had been hit by a car a few years ago and been badly injured. It might have slowed him down, but in the years that we knew him, he seemed pretty mobile. Watching Linus walk around his large home was always amazing to observe. He had his routes memorized, and while he would bump into things gently with his nose, he was efficient at finding his food and water, bed, and especially, his people. Linus had a very comfortable relationship with his partner in crime, Butters, a small chocolate-colored chihuahua. Neither Rachel or I had ever owned a dog, or had a personal relationship with one. My mom always told us that some of my siblings had allergies. I’m not sure if that was true, or whether it was more that seven kids in a small house was crazy enough. In any case, we were a little nervous when Dan asked us to dog sit Linus a few years ago, when both he and Susie were going to be traveling for several days, visiting friends and family to announce their engagement. Because of his special needs, they were not comfortable leaving Linus in a kennel, and since I had recently retired, I would be able to offer more care and attention. Honestly, we didn’t know quite what to expect, but we were game to give it a go. Dan and Susie provided us with all of the important supplies and comfort items. We learned that Linus would be our house guest for almost two weeks. That was a little longer than we had expected, but that was okay. At first I thought we would have Linus stay in our finished basement. It is comfortable and compact, and he could have his own space. Dan just smiled and said that the basement idea would not be the best. So we put up a baby gate at the top of the basement stairs. That way he wouldn’t have an unexpected tumble. The days went quickly and we enjoyed our furry houseguest. We laugh, looking back on the experience, at the closeness of our new friendship, especially for Linus and me. Dan had warned us that Linus was most comfortable when he was close to his people. It probably had to do with not being able to see the people in his environment. What that meant was that wherever you were in the room and whatever you were doing, it was likely that Linus would be there at your feet. If you look at the picture at the top of this story, you will notice my feet in the picture of Linus. We spent a lot of time that week like that. Our sleeping arrangements turned out to be the funniest. The first night, we tried to have Linus sleep on the floor, near the foot of our bed. We carefully scrunched up his sleeping blanket and arranged it in the perfect spot. Nope, that was not going to meet his needs. Linus communicated very clearly that he needed a lift up onto the bed. He wasn’t able to make the jump on or off the bed on his own. He spent that first night sleeping diagonally on the bed, between Rachel and me. He seemed very comfortable and slept soundly. In the morning Rachel grabbed her pillow and a few odds and ends and let me know that she would be moving to the guest bedroom in the basement. She would let “the boys” share the bed in the master bedroom. Needless to say, Linus and I spent a lot of time together, both night and day. He put up with me, and I got to know him pretty well too. Linus passed away early yesterday morning. While a sad event, Rachel and I were glad that we happened to be visiting and got to see our friend one last time. Our memories are happy ones and still make us laugh aloud. Farewell, buddy. Keep that tail wagging! 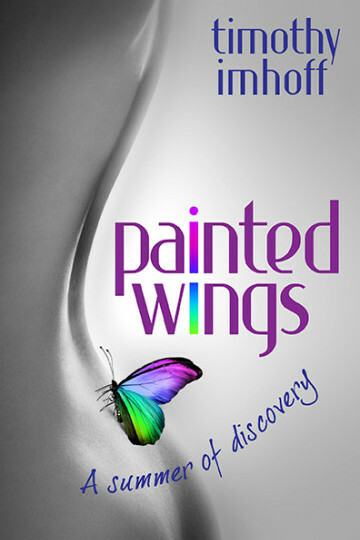 The paperback version of Painted Wings was just published by Cedar Lake Publishing and is now available on Amazon.com. The cover design was by Peggy Nehmen at N-K Creative in St. Louis, and the formatting was done by Jason and Marina at Polgarus Studio in Australia. My amazing editor was Stephanie Ernst. Over the years, I have heard from many readers that they prefer the feel of an actual book over an e-reader. It’s exciting that my first three books are now available in both Kindle and paperback versions. Painted Wings is a sophisticated romance novel with several twists and turns. It is a story that celebrates diversity and the beauty that can be found in differences. On Mother’s Day Rachel and I visited Laurel, Matt, and the grandkids in Manassas, Virginia. We always enjoyed our visits with them. Emma and Ian would get some quality play-time with Grandpa and Mimi. Laurel and Matt would get some rare alone-time to do errands and have a date night. We had planned on going to their cabin in the mountains of West Virginia, but the weather did not cooperate. As an alternate plan, Matt arranged a very special tour of the FBI Training Academy in Quantico, Virginia. Matt has been an FBI agent for several years. He was a computer scientist at Microsoft in Seattle before hearing the call to service following the terrorist attacks on 9-11. These days, Matt works as a squad leader in an FBI office that specializes in cyber-crime. He was the perfect guide for our private tour, since Matt went through the grueling, five-month training program a few years ago. The New Agent Training Program includes classroom instruction on topics like investigative techniques, law, behavioral science, forensics, and interrogation methods. New agents must pass rigorous physical fitness tests and demonstrate proficiency with a number of different firearms. Trainees are placed in real-life situations in a simulated town, where actors play criminals, and trainees are required to think on their feet as they respond to the scenarios. The FBI Training Academy is located on the sprawling Marine Corps Base in Quantico, Virginia, about 40 miles from Washington, D.C. The Academy takes up 547 acres. To enter we passed through a security gate manned by Marines and a second gate manned by FBI personnel. I was struck by the scenic forest that we drove through and the beautiful landscaping of the grounds. We drove around the campus, as Matt gave us descriptions of the various facilities. These included dormitories, classrooms, physical fitness gyms and tracks, firing ranges, and a large forensics laboratory building. We passed an entire area of the campus dedicated to Hostage Rescue Training, an important sub-specialty within the FBI. The parking area in front of the main administration building was crowded, and there seemed to be quite a bit of activity for a Sunday afternoon. Several young men and a few young women were unloading suitcases and garment bags from their cars. All of the men were dressed in coats and ties. We would see many more well-coiffed, young people when we went inside the building. Matt told us that this was a special day at the Academy. These were members of a new trainee class, arriving for the start of their five month program. Most of the trainees looked like they already were in pretty good physical shape. Some looked like they might have played college sports. As I watched their faces, I saw both excitement and some nervous expressions. I wondered what part of the training would create the most anxiety for the new agents. I noticed one trainee who didn’t quite fit the mold. He looked like he had never worn a suit before and had borrowed one for the occasion from someone who wore a larger size. He had longer hair and a few days growth of beard. I thought he looked like a young, absent-minded professor. Later, I asked Matt about the diversity of his class from a few years earlier. He said that there were thirty trainees in his class. Ages ranged from mid-twenties to mid-thirties. Most were men. Matt shared that they came from a variety of backgrounds. A few had law enforcement and military experience. But there were also teachers, accountants, lawyers, and even computer scientists! We spent the next few hours touring several buildings and walking around the campus. Along the way, we passed lots of different trainees and instructors, some walking alone and some in groups. Different categories could be identified by the color of their shirts. For example, the dark green polo-shirts belonged to trainees and instructors in the National Academy. This special program provides advanced law enforcement training to experienced personnel from agencies across the US and from over 150 different countries. Almost everyone we passed would greet us with a very formal, “Good afternoon, Sir” or “Happy Mother’s Day, Mam.” When I passed one young Asian gentleman with a green shirt, he put his hands together in front of his chest and bowed to me. Matt pointed out that the regular trainees carried blue plastic guns on their belts. This was designed to help them get used to the feeling of being armed at all times. One of my favorite movies is Silence of the Lambs. Jodie Foster plays Clarice Starling, an FBI Academy trainee. Matt said that this was the first time that the FBI had participated in the filming of a major motion picture. Most of the training scenes were shot around the campus. Walking around, I recognized the setting for several scenes from the movie. We saw the gymnasium where Clarice practiced hand-to-hand combat skills. We walked through Hogan’s Alley, where she walked through a car chase scenario on her way to meet with Agent Crawford, the head of the Behavioral Science Unit. We saw the wooden signs nailed to a tree near the end of the obstacle course that weaves through the woods around the Academy. In the movie the signs spelled out these words: Hurt, Agony, Pain, and Love It. 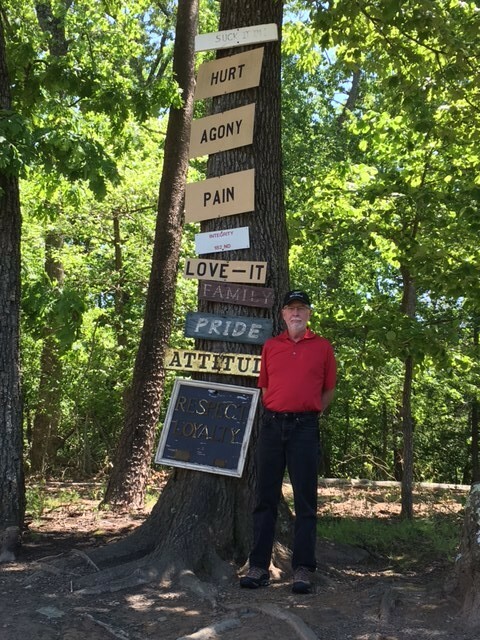 The actual group of signs included a few more: Family, Pride, Attitude, Respect, and Loyalty. I wondered how recently those signs had been added. Matt reported that the obstacle course was affectionately referred to as the Yellow Brick Road. Trainees were awarded an actual yellow brick when they completed this challenge. I thought that was fun, as The Wizard of Oz is one of my other favorite movies. We walked through Hogan’s Alley, the small town built for training simulations. It included a bank, post office, pharmacy, motel, small office building, bar, and even a working Subway restaurant. I wondered what nefarious criminal activities took place in these innocent looking buildings. Most were unlocked and we enjoyed checking a few of them out. Matt described one of the simulations he did in the office building, serving a subpoena to a disturbed businessman. I found two metal shell casings on the ground in front of a building used to practice forced entries into buildings. What better souvenirs of our visit. Near the end of our walking tour, we entered the main gymnasium. Again, there seemed to be a lot of activity going on. Along one wall were tables of food. In another area were a variety of games that one might find at an amusement park or carnival. A gregarious National Academy instructor waived us over and insisted that we help ourselves to pizza, popcorn, and cookies. He explained that the Academy was hosting a special group of kids for the day. The kids came from all over the country, and each of them had lost a parent in the line of duty. The day combined lots of fun activities for the kids, along with classes and counseling. The kids had already eaten, and there was a ton of food left over. Emma and Ian were more than happy to comply, and we enjoyed our feast, sitting in the grass outside of the building. All in all, it was a fascinating and thought provoking day. The trainees and instructors who we encountered were bright, professional, and dignified. The sacrifices that they are making are significant. The risks that they are willing to take for their country are substantial. Their motivations come from somewhere beyond personal recognition and reward. Like my son-in-law, Matt, they have found a calling to serve. At a time when leadership from some of our highest elected officials is suspect and lacks even a semblance of dignity, it was reassuring to see that some institutions have maintained their integrity. I am very proud of Matt and thankful to the men and women who work to keep us safe. 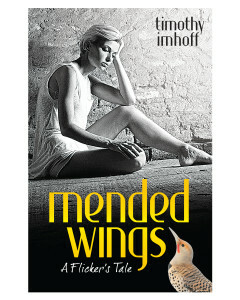 The paperback version of Mended Wings is now available from Amazon.com. The publication date was April 27, 2017. 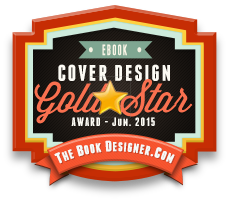 Thanks to Peggy Nehmen from N-K Creative for the beautiful cover. Thanks to Jason and Marina from Pulgarus Studios in Australia for the formatting of the book’s interior. I hear from lots of readers that they still prefer holding a real book, rather than an e-book reader. I hope you enjoy! I am working on the print version of my first novel, Painted Wings and hope to have that available in the next few months. Rachel made the arrangements for the lodging for our seventeen nights in New Zealand. 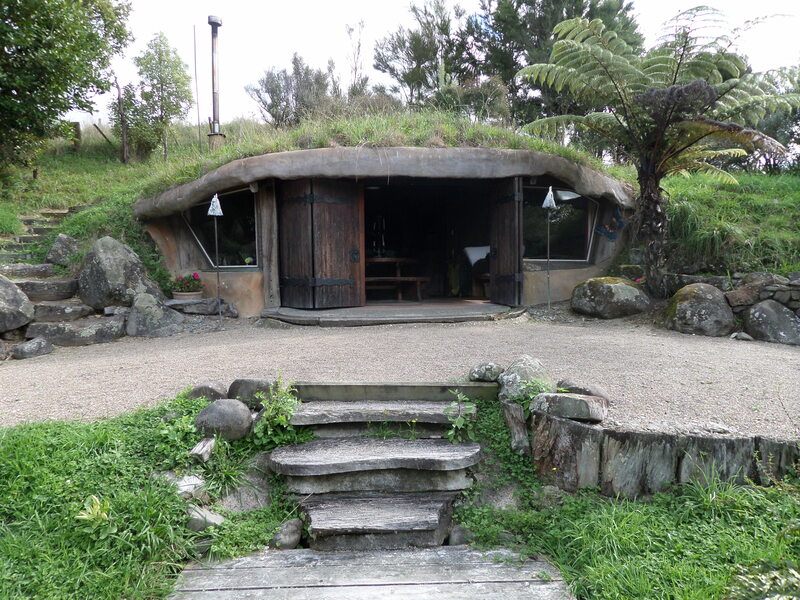 She surprised me when she described the accommodations for the two nights we would spend about an hour’s drive from the movie set from the Lord of the Rings and Hobbit movies. We had reservations for an evening tour and hobbit banquet at the actual Green Dragon in the Shire. Rachel found a most fitting place for us to stay. It was called Underhill and would be our own, private hobbit hole. Underhill was located on a working farm, a few miles outside of the town of Hamilton on the north island. Many years ago, before hobbits had been made famous by the movies, the farmer had built a single room, earth home next to a pond. It sounded like an early version of a man cave. The farm was passed down to the farmer’s daughter and her husband, and they decided to turn the earth home into a one-room bed and breakfast. Because of its resemblance to a cozy, hobbit hole, they named it Underhill. Rachel and I found the farm without difficulty. We parked our rental car next to a fence by the farmhouse. We had only been in country for a few days and were still getting used to driving on the left side of the road with the steering wheel on the right side of the car. Our hostess came out to greet us and helped us load our suitcases into the back of an ATV for transport to our lodging. We climbed in and rode down a dirt track that meandered through the farm. It would have been a muddy and difficult trek on foot. After coming down a steep hill, we reached a final gate. On the other side was Underhill. The main structure was carved into the hillside. The floor, walls and roof were constructed of natural stone and concrete. Grass grew on top of the roof and around the outside walls. Two large, wooden barn doors made up most of the building’s front wall. They were wide open, exposing the single room to fresh air, sunlight, and any other bits of nature that might want to enter. Walkways and stairs around the neat compound were built with natural stone and boulders. To the right of the house, built into the hill, was a small patio. On the patio was an ornate bathtub. Rachel and I had encountered outdoor showers during our adventures in Costa Rica, but never an outdoor bathtub. It reminded us of the television commercial for Cialis. Two small buildings had been built near the outdoor tub. One housed a modern shower and sink. We would learn that the running water system used rainwater. The other small building enclosed a composting toilet. The instructions said to sprinkle sawdust over everything after you had used the toilet. There was no electricity at Underhill. There were a few battery-powered lanterns. The main lighting at night was provided by candles. There was a large candelabra on the table in the center of the room and many other candle sticks located on other walls and surfaces. A coal-fired stove was available for heat and cooking, and we were given instructions on how to use it. The natural landscaping around Underhill added to the charm of the setting. A wooden deck extended out into a small pond, filled with Lilly pads. An old wooden bridge passed over a different part of the pond, allowing access to the other side. Cows could be seen grazing on a distant hillside, and we were told that we might be visited by some friendly llamas who lived on the farm. As we were being introduced to our new abode, our hostess mentioned that because of the natural construction and surroundings, there were mice that sometimes visited, especially at night. We were assured that they stayed under the cupboards by the sink, and that the traps were currently empty. Rachel and I were a little overwhelmed by the day, and I don’t think either of us really reacted to the idea of sharing our room with small, furry guests . The set up for meals was very simple. Later in the afternoon, the farmer delivered a portable ice chest with our dinner preparations and breakfast food. The menu for dinner included a large porterhouse steak, a package of eight giant sausages, a bag of salad fixings, a loaf of bread, and two pieces of chocolate cake. We laughed at how the meal was quite heavy on the protein side. There was a new-looking gas grill for cooking the meat. Breakfast consisted of yogurt, granola, and more fresh bread. We spent the afternoon relaxing around our private hobbit hole and enjoying the property. I even did my Tai Chi routine out on the deck, looking out on the pond. Early in the evening, I grilled our steaks, and we enjoyed our meal, sitting out on the deck. We were struck by how quiet and serene our surrounding were, not your typical bed and breakfast. It had been a stimulating day, and we chose to go to bed early. The bed was custom designed for the space and was unique. It was built into one wall and the shape was irregular and rounded. The person sleeping on the inside was against the stone wall and would have to climb over the other person to get out of bed. Rachel offered to take the inside. We got out our headlamps, placed them near the bed, and blew out the candles. It was very dark. We had just begun to doze off when we heard the first scratching coming from the cupboards under the sink. For the next few hours we listened to intermittent mouse activity, hoping that eventually they would figure out that there was no food out. Instead of the noises going away, they eventually changed in character. In addition to the scratching, now there was a banging and even high pitched mouse vocalizations. I told Rachel that I thought a mouse must be caught in a trap. It was time for a midnight, wild animal safari! Rachel and I had learned, as seasoned adventurers, that sometimes you have to improvise and make do with the tools that you find around you. I donned my headlamp and explored the kitchen area for weapons. I found a heavy sauce pan and a spatula. Rachel intervened and encouraged me to switch out the spatula for a set of salad tongs. With the headlamp switched on and armed with a dangerous sauce pan, I slowly opened the cupboard door. Inside was a mouse with one limb caught in a spring trap. He or she was dragging the trap around and banging into anything that was encountered. At a different time, I might have evaluated a variety of possible actions. But not that night. I bonked him with the sauce pan, picked him up with the salad tongs, and plopped him in the pan. I carried the pan outside and left it to be dealt with in the morning. My heart was beating a mile a minute!